This tutorial provides you with a foundation for working with Adobe Photoshop Elements photos. It is the first lesson in the Adobe Photoshop Elements 10 Digital Classroom book. 1 If the Photo Downloader dialog box is open, you will need to press Cancel before you can perform this step. In the Organizer, choose File > Get Photos and Videos > From Scanner. The Get Photos from Scanner dialog box. 2 Choose your scanner from the drop-down menu. 3 Press the Browse button to choose the folder in which you would like to save your scans. 4 From the Save As drop-down menu, select the format in which you would like to save your image. See Appendix C for an explanation of file format options. 5 Press OK to begin scanning, or press Cancel if you are not connected to a scanner and are simply exploring this option. 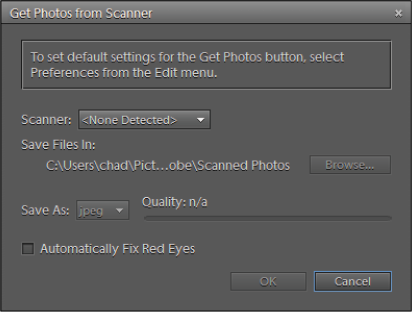 You can have Photoshop Elements automatically fix red eyes in your scanned image by clicking the checkbox for Automatically Fix Red Eyes. This option is also available in the Photo Downloader when using the Advanced dialog box. Get photos and videos by searching If you have photos and videos saved on your hard drive, but aren’t exactly certain of the location, you can have Photoshop Elements search for them. 1 Select File > Get Photos and Videos > By Searching. 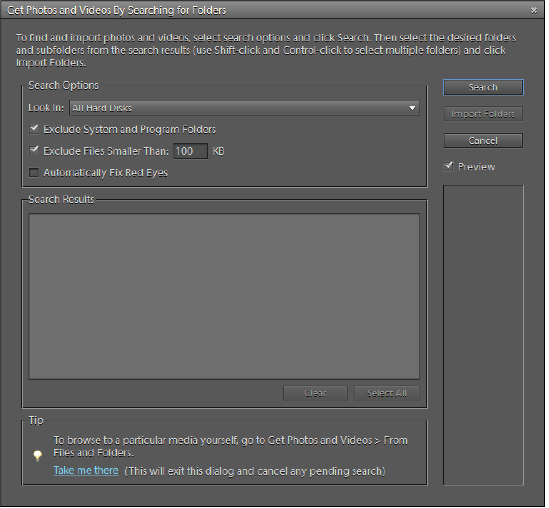 You can search through your entire hard drive or in specific folders to add images to Photoshop Elements. 2 Set search options such as location, exclusion size, and automatic red eye fix from the Search Options section. 4 When the search is complete, select the folders that you would like to import photos from, and press Import Folders. To select more than one folder, press the Ctrl key while clicking the folders. Manually adding individual photos and videos to Photoshop Elements can be a time-consuming process. To make this process easier, you can set a Watch Folder. This action allows the program to automatically import any new files that are found in the specified folder, such as the default Pictures folder used by Windows. Note that the Watch Folder feature is not available on the Mac OS version of Photoshop Elements; only the Windows version. 1 Choose File > Watch Folders. 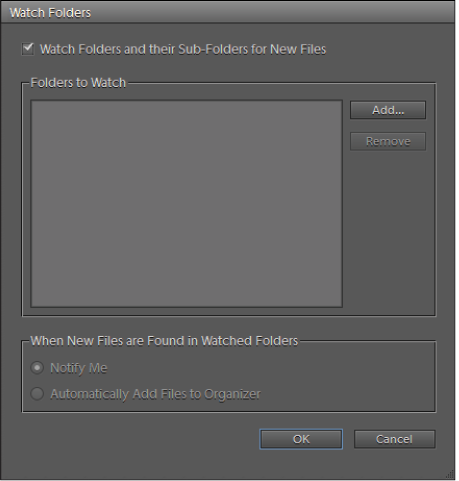 Setting a Watch folder makes it easy to import images. 2 Press the Add button and browse to find the folder you want to add to the Watch list. You can add multiple folders if you want. 3 Press OK if you have chosen a Watch folder, or Cancel if you do not want to set up a Watch folder.